The Thai-German Highland Development Programme (TG-HDP), Chiang Mai, Thailand (1981-1998) has been the environment where the P3DM method has been systematically applied within a project context. 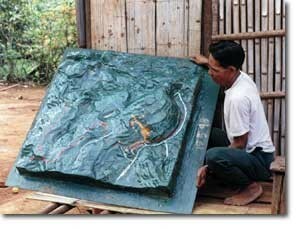 3D models were mainly done to represent single villages. 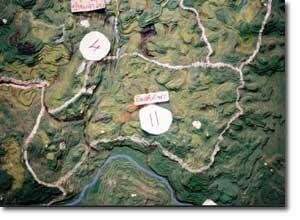 1:4,000-scale model of Bor Krai village, Sob Pong Subdistrict Pang Ma Pah District, Mae Hong Son Province, Thailand (Yr 1998). Note: The model shows land use and cover and village boundaries as conceived by the residents at Tambon level.